Rug Cleaners London delivers specialized Oriental rug cleaning on affordable prices. The beautiful colours of your Oriental carpet are becoming dull, so maybe it is time for a nice deep cleaning? If you want the deep cleaning of your precious Oriental carpet to be handled by experienced and fully insured experts, you should call us on 02034045107. Our expert company has been offering professional residential and commercial Oriental carpet cleaning in London for years. The company has trained, experienced and very well equipped professional cleaners which can clean nearly any type of carpet or rug, including Oriental, antique and other delicate rugs. When you choose us you get oriental rug cleaning at its finest. All the cleaning solutions used are highly efficient, and yet all-natural and safe for humans, animals and the environment. The company has invested in the latest generation cleaning machines and tools, because customer satisfaction is the most important factor for the management. To find out exactly how much the professional Oriental carpet cleaning service will cost you, just call our phone line 02034045107 or send an online request with a description of the type, size and condition of your carpet. The operators will give you a non-binding and free price offer promptly. 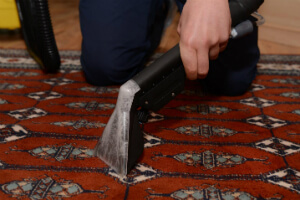 Rug Cleaners London has all the necessary experience, equipment and solutions to handle nearly any type of stain and to clean all kinds of carpets, rugs and upholstery efficiently and safely. The same goes for Oriental carpets. The cleaner who is appointed to perform your cleaning service will first do a thorough inspection of the carpet. The goal of the inspection is to determine the type of Oriental carpet it is, the material, the technique used for making it, and whether there are any stains and soiled areas which need to be pre-treated. The rug will then be vacuumed carefully, so that as much dust and other dirt is removed. The stains and soiled heavy traffic areas will be pre-treated with the appropriate solutions. The cleaner always performs a safety test on a small spot on the carpet before applying any kind of cleaning solution on it. If the rug can be washed, the cleaner will proceed with the steam cleaning, shampooing and rinsing it while extracting as much of the water used as possible. The fringe will be washed manually, separately. It is likely that if you have an Oriental rug, it would be a safer option to deep clean it through the dry cleaning method. The carpet will be thoroughly vacuumed, and any stains which can be removed will be pre-treated. Then the dry cleaning solution will be tested on a small hidden spot, and if there is no negative reaction, it will be carefully applied on and in the carpet with a machine designed to be gentle to the fibres and yet to embed the solution as deep as possible. The solution will stick any dust, dirt or another residue to itself as it dries off. When it is completely dry, the cleaner will remove all of it together with the dirt with the help of a powerful professional vacuum cleaner. The dry cleaning will refresh the colours and the smell of the rug and will also help make the air in the room cleaner and healthier. The Oriental rug cleaning price is affordable and fixed. No deposit is required for booking. You will pay once the service has been provided, and there will be no unpleasant surprises with hidden fees! All you need to do now is to call the customer support service at 02034045107 or send an online booking request here. The confirmation will come in up to 2 hours via SMS and e-mail. The company offers same day cleaning, or cleaning on any other day of the year, so pick a suitable day and hour and call now! Get your Oriental rug cleaning now!